Hayao Miyazaki didn't have a grand future in mind when he originally created Totoro, one of plush toys, hash-tags, and enduring cameo appearances. He didn't even really have a movie in his sights when he began the initial creative process: My Neighbor Totoro started out as a children's book, a straightforward departure for the filmmaker after Nausicaa of the Valley of the Wind and Castle in the Sky, designed as a love letter to his country and his past. The gradual impact it has had, though, since taking shape into an animated film under the Studi Ghibli banner, is immeasurable; while global audiences were aware of Japanese animation, this one broke those barriers open in delivering an endearing mythological creature easily seen as a manifestation of youthful, innocent imagination. It's the type of movie almost entirely devoid of villainy or suspense, driven by its own delightful focus on exploration, trust, and hope in ways only Miyazaki's watercolor-esque whimsy seems able to achieve. The story itself is as uncomplicated as they come. In late-50s Japan, two sisters -- Satsuki and Mei -- move to a peaceful countryside home with their father, a university professor, which they've done to be closer to the hospital where their mother is being treated for an unspecified, long-lasting illness (though given the time period and Miyazaki's own hints, it's reasonable to assume that it's tuberculosis). Once they arrive at their new house, they start exploring its ramshackle cracks and crevices, only to discover that small black dust spirits, called "soot sprites" by their new nanny and next-door neighbor, occupy some of its darker spots. There's something unique about this house and its proximity to a giant nearby tree, and it's only once Mei explores the grounds alone that its big, fluffy secret emerges: that of Totoro, a rotund benevolent furball with wide eyes and a massive grin. As the family acclimates to their new surroundings and the situation with the mother, the "mystery" of Totoro's presence captures the girls' attention. Unlike the grandness of Laputa in Castle in the Sky and the Toxic Jungle in Nausicaa, Miyazaki brings the artistry down to a personal level while depicting the Japanese countryside, conveying the reserved, natural beauty of tree tunnels and dusty wood-'n-tile bathrooms. In this realistic environment, his ability to create energetic characters becomes even more pronounced; Satsuki's lively confidence is enriched by her caring big-sister dependability, while Mei's headfirst bravery into the wooded areas is nothing short of charming. He's built this journey very much like a customary, harmless children's cartoon, with joy as the driving force and no threats to be seen, outside of a looming melancholy sensation about their mother's condition. Yet, there's subtlety and charm around every corner in the laughter, the sense of discovery, and the comfort of their new house -- the place where their ill mother will come as soon as she's ready, where they might coexist with little dust ghosts. 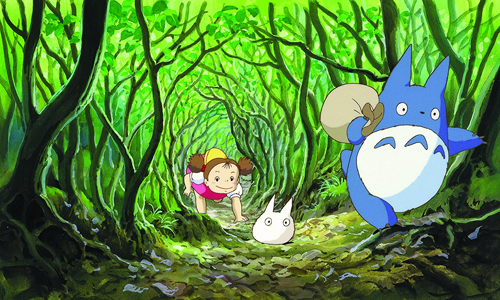 All this happens before we're even introduced to Totoro himself, an original creation of Miyazaki presented as a form of wilderness "spirit", and the moment he's revealed is an enchanting one where fear of a foreign beast surrenders to the appeal of a fluffy stomach and a sun-kissed afternoon. This occurs in an environment that allows the fantastical to delicately coexist with everyday activities, where gathering twigs for fire, waiting at a bus stop, and watching seeds sprout in a dirt bed are enlivened by brushes with a mystical flip-side. 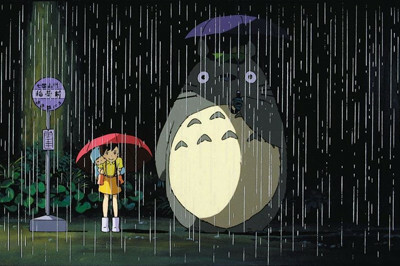 A scene involving Totoro, rain, and an umbrella makes me grin ear-to-ear without fail, no matter how many times I've seen it. Simple, whimsical delights are built around this rabbit-owl-raccoon hybrid, and the clever thing about My Neighbor Totoro is that the relationship between the girls and this feathery spirit may or may not be the product of their imaginations and dreams, something the story handles with a vibrant sense of humor and respect to the perspective of children. When urgency does surface in the girls' world, Miyazaki allows those realms of reality and fantasy to intertwine in a expression of the family bond, suggesting that, hey, those comforting elements of the imagination aren't as unreal or immaterial as they might seem. The landscape he's created for the forest spirits and those who experience it isn't one of conflict, of fear and trepidation, but one of mere acclimation to tricky situations. 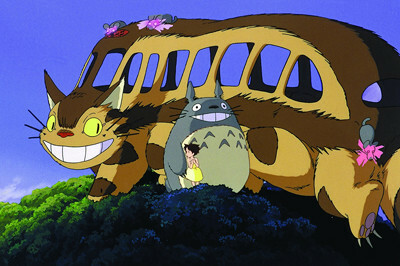 The eerie, creaky darkness of their fixer-upper house is an opportunity for the girls to yell into the void and show that they're not scared, instead of generating fear of ghosts or sadness about their previous home, while Satsuki seeing Totoro at a bus stop as he awaits his "cat bus" in heavy rainfall is one that joyfully validates the flight of imagination that her young sister saw in her play-time earlier on. My Neighbor Totoro delightfully conveys the message that adjusting to situations isn't a scary thing and that everything's going to be alright, and it does so through a fanciful, endearing departure from Miyazaki's previous works that's enriched by a simple purpose and its side-stepping of easy drama. Note: Film review from Disney's 2013 release of My Neighbor Totoro. Read that review: here. 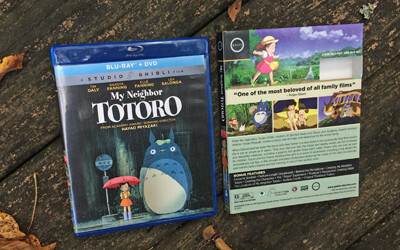 Shout Factory and GKIDS move into My Neighbor Totoro's Blu-ray spot with a two-disc presentation, including strikingly familiar artwork on the front that's only differentiated by the change in branding on the top border. The interior artwork tends to be another story, with smartly-designed discs and a fitting inlay still on the reverse of the cover. 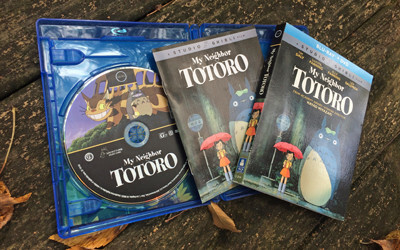 GKIDS have also included their own standard-definition DVD for Disc Two, as well as a thin, exclusive Booklet with promo photos and two textual blurbs: one from producer Toshia Suzuki from 2012, and another from Hayao Miyazali from 1986 about "What is Totoro?". A large number of Disney's Blu-ray presentations of the Studio Ghibli catalog arrived with one or two issues that kept them from being perfect, some more significant than others; the subtitle translation for Princess Mononoke, lossy non-HD audio for Ponyo, etc. With thoroughness and lots of love behind them, GKIDS have taken on the rights and aimed to rectify almost all these issues, but since they've taken on all the films on Blu-ray, they also have shouldered the burden of re-releasing those few titles that didn't have any issues. My Neighbor Totoro is one of such titles: the initial presentation from Disney -- which I reviewed here -- contained an impeccable 1.85:1 restoration of the vibrant artwork that certainly doesn't look from the ‘80s, admirably clear and resonant Master Audio 2.0 tracks in both the original Japanese and English dub language options (and in French), and both the original Japanese-language subtitles and English SDH dubtitles. GKIDS' presentation seems to look, sound, and operate without distinguishable differences between it and Disney's original Blu-ray, and that's a wonderful thing. A (repeated) note about the subtitles: the standard English subs are not dubtitles; however, the English SDH titles are. One example of the differences between the tracks comes in the name of the black dust spirits: they're called "dustbunnes" before Nanny corrects them in the standard track, while the SDH track repeats the dub by referring to them as "soot gremlins". My overarching sentiments about this delightful film haven't budged over the years, so take it away, me from nearly a half-decade ago: "Hayao Miyazaki broke away from the grand, fantastical worlds of his previous creations for My Neighbor Totoro, instead going for something straightforward, minimal in mythology, and focused on the intimacy of the Japanese countryside while depicting a family in a transition period. Studio Ghibli proves in this animated feature that clear-cut stories and idealistic looks at human drama can be quite poignant when crafted this gorgeously, coupled with a fluffy forest spirit that that proves to be a testament to the enduring nature of escapism and imagination. And, yes, Totoro himself is a brilliant and lovable creation, a wide-eyed, large-toothed, harmless creature who presents a delightful message about not fearing everything that is mysterious or unpredictable." Had this been a straight reissue from the same studio, only with mildly tweaked artwork, I would've just suggested skipping over the release; however, since GKIDS have undertaken the effort to duplicate the audiovisual merits and extras for their re-release under Shout Factory's label, their presentation deserves the same High Recommendation as its precursor. Those who already own the previous Blu-ray and aren't interested in having cohesive spine artwork with the other more substantially tweaked Ghibli Blu-rays upcoming from GKIDS (or the exclusive booklet or textless credits) needn't bother picking this one up, though.